Our line of Custom Colors give you the new trend of white or colored kitchen cabinets you have been looking for. 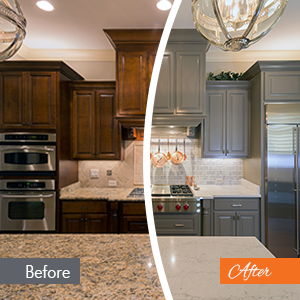 With our Lightspeed® instant-cure commercial finish included, for which we’re famous, the result is far different from simple cabinet painting. Not sure of the color you want? We can help you choose! We can take you step-by-step through the process of choosing the color to suit your style. Call your local N-Hance team at (505) 314-1997 for more information on how N-Hance can transform your kitchen, bathroom, or other cabinetry with our Custom Colors.